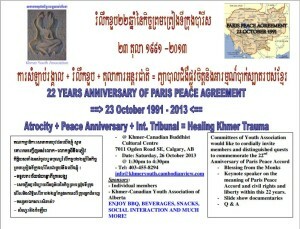 Committees of Youth Association would like to cordially invite members and distinguished quests to commemorate the 22nd Anniversary of Paris Peace Accord. – Keynote speaker on the meaning ofParis Peace Accord, civil rights and liberty within this 22 years. 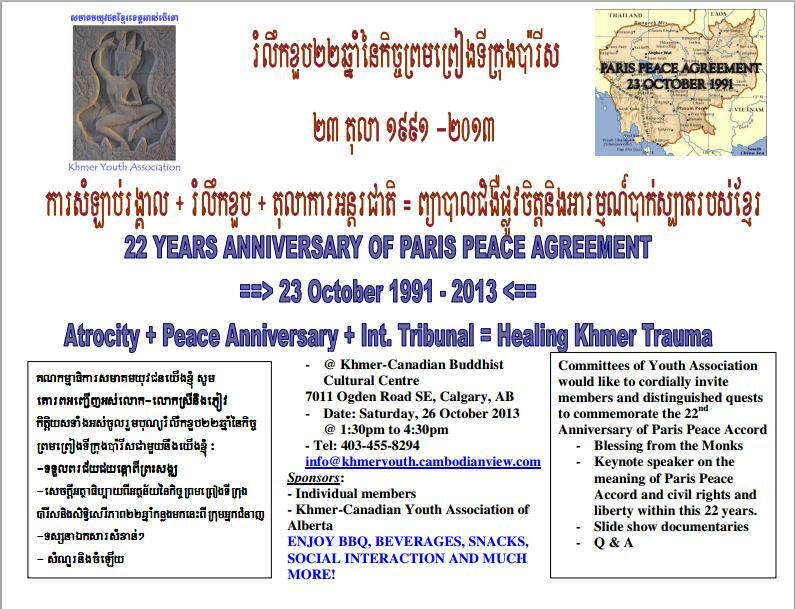 Khmer Youth Association of Alberta would like to solemnly announce to the Khmer youths and compatriots, either inside or outside Cambodia, to hold or participate with the 22nd Anniversary of Paris Peace Accord: 23 October 1991 – 23 October 2013 collectively. 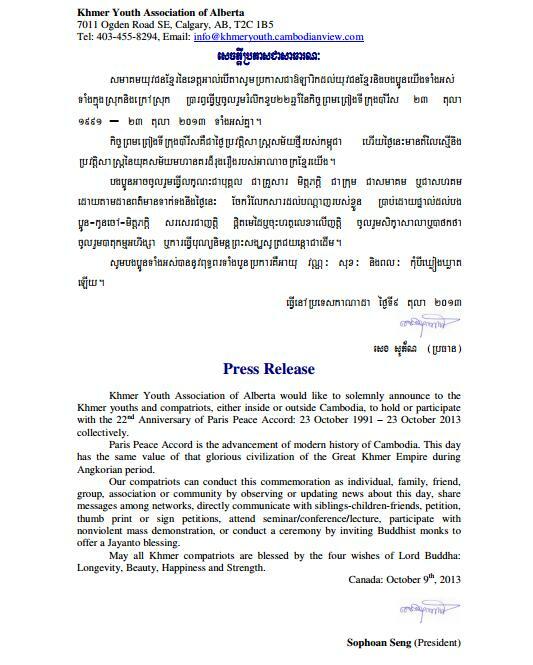 Paris Peace Accord is the advancement of modern history of Cambodia. This day has the same value of that glorious civilization of the Great Khmer Empire during Angkorian period. Our compatriots can conduct this commemoration as individual, family, friend, group, association or community by observing or updating news about this day, share messages among networks, directly communicate with siblings-children-friends, petition, thumb print or sign petitions, attend seminar/conference/lecture, participate with nonviolent mass demonstration, or conduct a ceremony by inviting Buddhist monks to offer a Jayanto blessing. May all Khmer compatriots are blessed by the four wishes of Lord Buddha: Longevity, Beauty, Happiness and Strength. ENJOY BBQ, BEVERAGES, SNACKS, SOCIAL INTERACTION AND MUCH MORE! Previous PostPrevious Comment: Sam Rainsy Needs to Get Heavy on the Detail. And Fast.